Colin KOLLES: Well, we are a new team, new cars and rookie drivers, so it's not easy, for sure, but I think they've done quite a good job in the first three races, not making too many mistakes. Today also went quite well, at a different level to the top teams, of course, but I think that we are improving steadily, so we are making step after step. Q: How easy or difficult has it been to build up a team, especially one that was really starting on the back foot? Kolles: Not easy, it was a lot of work, I can tell you, in a very short period of time. I think people are underestimating what has been done or how difficult it is. Q: In terms of getting your personnel, for instance, you're not really based in the middle of Oxfordshire in England, in among existing racing teams. Kolles: Yes, for sure, Murcia is not really the centre but obviously I was able to put it together. I think I have quite a good network and it was possible with the help of people who were loyal to me over a long period of time. Q: Can you just clarify the rumours of the relationship between the team and Dallara? Kolles: I can clarify this. Obviously I have spoken with the people involved and I think they have been misquoted and misunderstood, so actually there is nothing more to say about this. Q: Peter, a very difficult start to the season for you. I'm sure you didn't come back into Formula One for a start to the season like the one you've experienced. Tell us what has happened? Peter SAUBER: It's not so easy to explain, maybe you have to ask the technicians. We expected more, especially after the good winter tests. Q: What were the basic problems, at the last race, for instance? Are those engines finished for the year or was the sensor the problem? Sauber: It was a pressure sensor and we can't use the engines again. Q: And then at the first race you had problems as well. Sauber: In Bahrain, there were two hydraulic problems. One was a mistake - I think both failures were not necessary. Q: And again, your drivers, an interesting mix of the experienced and the newcomer. Tell us how you feel about those two? Sauber: It's very difficult to talk a lot about the drivers because during the last three races we have had a lot of problems, and it has been impossible for Kamui (Kobayashi) and Pedro (de la Rosa) to show their talents. Q: So you're really waiting for the season to settle down. Q: Have you had a good trouble-free weekend this weekend? Q: Tell us also about the transition of Willy Rampf, who has been with the team for such a long time as such a faithful servant, to James Key, your new technical director? Sauber: I think Willy's plan to leave the team was for more than one year. Q: What have been his great strengths? Sauber: Oh, he has a lot, a lot of strengths. He started with us 14 years ago as a track engineer and then has grown up slowly and we had a lot of success with Willy, especially in the 2001 season with Nick (Heidfeld) and with Kimi (Raikkonen), when we finished fourth in the World Championship. Q: How easy is it going to be for James to take over? Sauber: I think it's too early to speak about that, especially in this difficult period. For sure it's not easy for him to take over the team now and to make progress very soon. Q: Will Willy keep coming to races? When does he actually clear his desk and leave? Sauber: The last race under Willy's control was in Malaysia, in Sepang, and this one is the first race for James. Willy leaves at the end of the month. Q: Eric, again, a question for you about your drivers: the experienced Robert Kubica and the newcomer Vitaly Petrov. Eric BOULLIER: I think we have a good pair of drivers, one experienced one and one rookie but both very, very motivated. Q: How do you see them working together over the last three races? Boullier: Both of them are very eager to do well and they are working well together. They have to learn about each other, but Robert is very keen to give any advice to Vitaly. They're working very well. Q: What about your own experience as a new team principal; is it a very steep learning curve? Boullier: Yes, very, very, very with a big slope. It's very exciting and I'm very, very pleased to be here. It's definitely a challenge, because F1 is huge, a lot of requests, a lot of people, but I'm starting to fit in well. 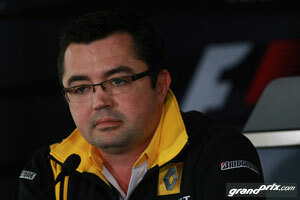 Boullier: Everything is a surprise, because it's new. You have so many people, so many responsibilities, it's just seven days work (a week). But I'm definitely ready for it. Q: You have Peter Sauber behind you, Adam Parr alongside you, both their teams would like to be fifth in the championship this year. What are your aims, because I think you would also like to be fifth, if not fourth? Boullier: No, my aim is to be better than fifth. Obviously we would like to be as high as possible in the hierarchy. We have to be reasonable, so fifth would be the minimum. Q: Do you see Williams and Sauber as being your major rivals? Boullier: Some of them are our main rivals. Q: Adam, your feelings about fifth in the championship? Adam PARR: Well, I think we've got a bit of work to do to even claim that but we have ambitions, like Eric, beyond fifth as well. Q: What about the Cosworth partnership; do they feel like a new engine supplier? How does it feel like to work with them? Parr: They are a new engine supplier and the relationship feels very good, I think, in the sense that we have a very similar philosophy about life and what we're trying to achieve. Unfortunately, it's always the case that when you change engine (supplier), it's a challenge. We've definitely got challenges on all aspects of the car that we need to overcome and that includes the engines, so we're working with them very closely on that, and I'm very pleased to say that from Kevin Kalkhoven (Cosworth owner) down we've got the complete support of Cosworth and they are passionate about what they do and they are very good engineers, so we're expecting to make good progress on that front. Q: In terms of what they've supplied, you would say that they are not a new engine supplier at all. It seems to have been very reliable. Parr: Well, it's been reliable in some respects but we do have some underlying issues that we have to address. We're not there yet. As Patrick (Head) likes to remind me on an hourly basis, anybody who thinks that they've got the engine or any other aspect of a Formula One car sorted out is just kidding themselves. We're very early in this programme and there's a lot of work to be done. Q: Similarly you have an interesting mix of drivers, the most experienced driver in Formula One and Nico Hulkenberg as well. You've also been nurturing Nico for many years. Parr: Yes, well, one of the great highlights of this season for us has been our two drivers. It's a real pleasure to work with both of them for very different reasons. Rubens (Barrichello) is a fantastic driver; one hoped and expected that his technical input would be phenomenal but not only his understanding of what's going on is amazing, but also his ability to identify potential solutions. So having him is wonderful. Also you can just see the way that he can dig deep and find that extra few tenths in qualifying. He's leading the way, as one would have hoped. Nico is a very pleasant surprise, particularly in Malaysia where he showed what he could do and in the rain which is not always the case. Nico's a very special guy, not only is he a great young racing driver, but as you may know, he volunteered to work in the factory, he's worked in almost every area of our factory alongside the guys on the shop floor. He's got their complete respect and that shows through in everything he does, so we're very happy and very proud to have both of those drivers. Q: And when did your relationship start with him? Parr: With Nico? It's been about three years now. Of course, the best thing about working with Nico Hulkenberg is that he brings with him (his manager) Willy Weber who is just fantastically amusing at all times. Q: (Jie Wu - Autonews China) I have a question for Mr Sauber. The Sauber team became a private team again when you took it over. What's the difference in atmosphere and Formula One environment between when BMW took over the team and now? What has changed? Sauber: I think the atmosphere was good as a works team as well as a private team. I think the atmosphere was also very good with BMW, there is no difference. For sure, the team is now much smaller, it's about a third smaller than before with 260 employees. For sure it's more a family than a big company. Q: (Jie Wu - Autonews China) There have been lots of manufacturer teams in F1; what's the difficulty for private teams to survive and fight for their dreams in F1? Sauber: Some of those factory teams have left Formula One. I think about three of the big ones and I think that today we have a good combination between big teams and private teams. It's the same question (of survival) for Williams and Hispania. It was a big question for Williams over the last forty years. It's very difficult. When we look back to the last 20 years, more than 25 teams have left Formula One. It's difficult, yes. Kolles: I think Adam knows that it's an even bigger amount. Parr: Well, the number is over 50 teams since 1970, I think, have failed to survive in Formula One. There are two things: one is yes, it's difficult, and it's always difficult because you're raising... the discretionary part of your income is from sponsorship, and sponsorship is something that people can chose to do or chose not to do, and I think that even though Formula One offers incredible value for sponsors, it's always a big decision for a company to come into Formula One. Having said that, I think that things are better and I think they are going to get better because having only two manufacturers left in Formula One means that the majority of the teams are very realistic about having to raise a budget and they don't want to burn money, and even the manufacturer teams who are left don't want to burn money either. So I think that within this so-called resource restriction agreement, we have a structure to continue to reduce costs for everybody and I think there's a real will to do that. Although it's tough, I think it's promising and it's certainly better... when I started, you could argue that ten out of eleven teams were effectively factory-funded teams or shareholder-funded teams. So it's a lot better now. Q: (Joe Saward - Grand Prix Special) Regarding the tyre supply next year, it seems like there's a choice between having a big brand or cheap tyres. Which would you like to have? Sauber: Yeah, for sure, tyres for free, it's possible but I think more importantly is that we have only one tyre supplier. Boullier: First we need to have tyres, if possible for free and it doesn't matter if it's a big brand or not, there's obviously a safety issue as well, to have proper tyres. Then, as part of the show, we need to decide if it's only one tyre spec or not. But we need tyres. Parr: I think there are at least half a dozen companies in the world who could provide us with good quality tyres, that would give a good show and be perfectly safe. I think they are all good companies with good brand names and I think it's absolutely essential that we do a good deal, which means free tyre supply for the teams. Secondly, it must be the same for everybody in all aspects because if it's a standard tyre, it's simply not on to have a two tier or a different approach for one team rather than another. So I think we've got a bit of work to do there. Fortunately, we have Bernie (Ecclestone) who has been asked by the F1 Commission to negotiate and find that supply and nobody's better equipped to do it than him, so I'm sure we will get what we need. Q: (Joe Saward - Grand Prix Special) Can I follow up with a question about engines? We're talking about having two manufacturers. In fact we have two manufacturers who have just gone into a very large industrial alliance together, which, logically speaking, when it comes to creating new engines for 2013, are not going to both spend the same kind of money to compete against one another. Do you see a situation whereby we only have Ferrari and small, specialist manufacturers, the Cosworths of this world, in the future? Sauber: Yes, we will drive with Ferrari engines. It's not a problem for us. Kolles: And we drive Cosworth. Sauber: But I think the manufacturers that we have now will stay in Formula One. Maybe we will have some new manufacturers like Volkswagen. Kolles: Maybe we will have some new manufacturers, yes, that's possible, but at the moment we are an independent with Cosworth, so we hope that Cosworth will still be on the market and for the moment we are happy with Cosworth and we look forward to having a good relationship. What will happen after 2013? I think it's very important to maybe have the world engine, this is very important for certain manufacturers, to get them the entry, so from my point of view we will support the world engine, if we were asked, and I think that Mr Sauber would support this and I think that a few others would support the same. For sure, on the other hand, there are certain people who are against the world engine and they have their own ideas, but as it looks at the moment, the world engine might be a solution, to attract new manufacturers. Parr: I agree with both those comments. We've got four engines in Formula One at the moment and I don't think that's going to change before 2013 and I think it's very likely that from 2013 there are going to be more suppliers rather than fewer and that's because we're going to have an engine in 2013 that's going to have better energy consumption, a greener engine and I'm sure it will also be cheaper to manufacture and I think that will attract other companies into the sport. I think that's another positive thing on the horizon, because we need to change the structure a little bit. We have too few suppliers and the engines cost too much, just too much to make. The technology is getting a bit out of date now as well. Boullier: I agree with all the comments, obviously. I would add that engine technology needs to be back for an engine manufacturer like Renault as we are definitely interested in using Formula One as well as a technology platform to be used for road cars. I think cost needs to be controlled as there is a new technical package to be brought in after 2013. I don't think we will see just one new engine maker. I think there will be, as Colin said, more engine manufacturers interested in maybe coming into Formula One, and that's good. Q: (Joe Saward - Grand Prix Special) And just to follow up on the point that Adam made, do you think that KERS and/or any other energy recovery system is essential for the future? Boullier: Formula One needs to be a little bit greener, and as Adam said, with a greener engine, KERS or any hybrid system needs to be back in, because it's the future on our roads. So Formula One needs to stick to this philosophy as well. We have already developed something in the past which I think we're all discussing to maybe put it back next year under certain conditions, but it definitely needs to be part of the package. Parr: Absolutely, we think a big KERS is going to be a very important part of the 2013 engine. Kolles: Well, I don't fully agree with this point. I was always against KERS and I am still against KERS. I agree that we have to be a greener Formula One, that's fine but if you look at KERS - if it's really green - and you look into the details, then KERS is not really green. So I think that we should look into reality and be realistic and not dreamers. This is my simple point of view. There are certain interests here, obviously from car manufacturers. I agree with this, I have no problem with this, but we, as a small team, are not going to afford to invest such amounts of money into technology, so we are definitely happy to find solutions and I fully agree that Formula One has to become greener to attract sponsorship, to make it more viable for everybody, basically, to make the business more viable, but I don't think that KERS in the common sense is the best solution. I would agree with the Williams solution which is obviously a different solution than the battery solution. This is a more reasonable solution, but as we are discussing at the moment, to use a KERS based on batteries, people would be surprised which is more environmentally friendly or not if you look at the detail. Sauber: Green or not green, I think Formula One has to follow this direction, especially the manufacturers. Maybe we can wait until the engine changes in 2013, together with maybe a world engine, I think it will be easier for everybody.